Flowers is a graceful garden decoration, especially when it comes to such traditional garden crops such as Lily and Tulip. Tulips and lilies are bulbous perennials, and plant them in the fall need. Exact pick-up time will vary depending on climate zone. To plant tulips in the fall should be for 6 – 8 weeks before hard frost. The soil temperature should be above 10 degrees Celsius. Planting time of tulips depends on the climate zone. For less warm climate is early autumn or even late summer. For the more southern areas it may be late autumn. Plant tulips immediately after purchasing the bulbs. Do not over tighten, because you can store the bulbs not in the ground - against the laws of nature. Plant Tulip bulbs deeply, not higher than 16 inches from the surface of the earth. The bigger the bulb the deeper it should be planted. Although tulips are perennials, many gardeners treat them as annuals, and every year transplanted again. So do the growers in Holland. Tulips often do not behave as perennial flowers. Why? The matter in their origin. Tulips come from Eastern Turkey and the foothills of the Himalayan mountains. The best climatic conditions for them cold winters and hot, dry summers. Perennial tulips are varietal and hybrids will not germinate the following year. As soon as the tulips planted in the fall, they put down roots that continue to grow slowly under the ground all winter. Because of the cold temperatures, the tulips begin to sprout quickly and bloom in the spring, as soon as the soil warms up slightly. By the time of flowering of the mother bulb grows old and dies, there are subsidiaries of the bulb. If you are planning to raise perennial tulips, feed them every year in the fall. The Tulip bulbs contains its own system of preservation of nutrients, but only for one year. For fertilizing, use organic fertilizer or compost. It so happens that in the fall you do not have time to plant tulips. But you have a desire to grow them in my garden in the spring. In this case, you can buy sprouted tulips in pots. Leave them at home for spring and summer. In the fall you can plant Tulip bulbs in the ground so they bloom next spring. 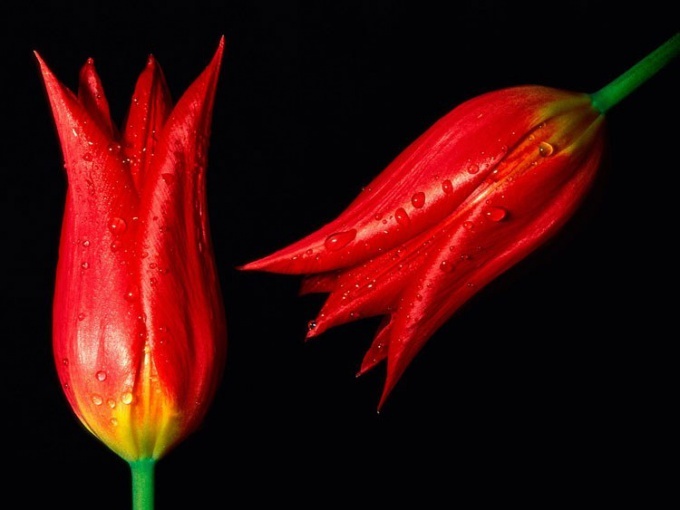 The same can be done with tulips, a gift on Valentine's Day. As well as tulips, lilies should be planted in the fall. It is better to plant them to a depth of not less than 25 centimeters. Then the stem will be firmly in the ground. If the soil does not freeze in the winter, in such climatic conditions to plant lilies is useless. These flowers need the cold period of hibernation. Fertilize the lilies better in the spring, using compost and humus. As lilies and tulips love-ventilated, sand soil. High humidity for them is death. When planting bulbs, you can add the sand. Lily is a perennial plant, but it is better to repot after flowering. Cut the stem to the root. Divide bulbs and transplant them tip-top. To put them need each other at a distance equal to the three sizes of follicles.